Linear and Radial temperature range charts designed for mobile phone displays, representative of the stimuli used in our crowdsourced experiment. The gradient bars encode observed temperature ranges and are superimposed on gray bars encoding average temperature ranges. Corresponding Week, Month, and Year charts display the same data. 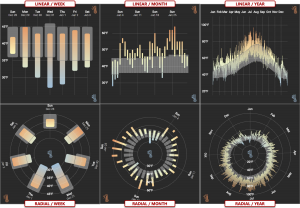 ABSTRACT: In the first crowdsourced visualization experiment conducted exclusively on mobile phones, we experimentally compare approaches to visualizing ranges over time on small displays. People routinely consume such data via a mobile phone, from temperatures in weather forecasting apps to sleep and blood pressure readings in personal health apps. However, we lack guidance on how to effectively visualize ranges on small displays in the context of different value retrieval and comparison tasks, or with respect to different data characteristics such as periodicity, seasonality, or the cardinality of ranges. Central to our experiment is a comparison between two ways to lay out ranges: a more conventional linear layout strikes a balance between quantitative and chronological scale resolution, while a less conventional radial layout emphasizes the cyclicality of time and may prioritize discrimination between values at its periphery. With results from 87 crowd workers, we found that while participants completed tasks more quickly with linear layouts than with radial ones, there were few differences in terms of error rate between layout conditions. We also found that participants performed similarly with both layouts in tasks that involved comparing superimposed observed and average ranges. InfoVis 2018: Visualizing Ranges over Time on Mobile Phones: A Task-Based Crowdsourced Evaluation from VGTCommunity on Vimeo. EXPERIENCE the EXPERIMENT: You can perform the experimental trials yourself at https://aka.ms/ranges. This website can only be viewed from a mobile phone held in portrait mode, and it is compatible with recent versions of mobile web browsers such as Chrome and Safari. The experiment takes about 20-25 minutes to complete. OPEN SOURCE: The source code of our application is available under a MIT open source license at https://github.com/Microsoft/rangesonmobile. Our experiment data and our analyses are available alongside the application source code in the same repository. By Matthew Brehmer (Microsoft Research), Bongshin Lee (Microsoft Research), Petra Isenberg (Inria), and Eun Kyoung Choe (University of Maryland) This repository is maintained by Matthew Brehmer. It contains supplemental material for a journal paper including source code for software used in an experiment as well as experimental data and analysis scripts.